Emily is passionate about helping people overcome limitations endured from soft tissue dysfunction so they can live life to the fullest. As an occupational therapist, Emily believes in using a holistic approach and client-centered practice to ensure individual needs and avenues are considered when tailoring treatment plans for optimal outcomes. She treats clients of all age groups, professions and varying soft tissue injuries. Treatments involve using a variety of hands on neuromuscular techniques to work through muscle tension, muscular imbalances, restore muscle movement and prevent further injury. The ultimate goal is to enable people to return to their everyday activities symptom free. Emily has undertaken professional development in dry needling, kinesiotapping, myofascial release, trigger point therapy and dynamic neuromuscular stabilisation. 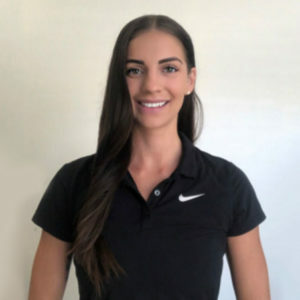 Using her wealth of knowledge in the care and management of soft tissue conditions, Emily educates and empowers individuals to be a driving force in reaching their full potential in overcoming the barriers of pain and maintaining soft tissue function through lifestyle changes. Emily comes from a sporting and swim teaching background, with a strong interest in physical activity and overall wellbeing. She enjoys swimming, yoga, going to the gym and fishing.